As you have already found out, "Dodge Wobble" (also known as Ram Death Wobble ) is the horrible front end vibration that starts when one tire (usually the right tire first) hits a groove or bump in the pavement somewhere around 40~50mph. Dodge Wobble is quite possibly the worst possible downside to having a coil-sprung front suspension on a vehicle with a track bar or panhard bar. Among the vehicles affected by this design are the Dodge Ram 1500, Dodge 2500, and Dodge 3500 (and also include Jeep Cherokee XJ, the Jeep Grand Cherokee ZJ and WJ, TJ and JK Jeep Wrangler, and trucks like Toyota, Ford, as well as early Ford Broncos). This page is specific to the Dodge Ram Death Wobble Problem and discusses Death Wobble Causes and Cures. Death Wobble is also extremely difficult to try to diagnose and fix, because it is actually caused by slop in the entire steering system and the axle attachment as a whole, not by one component. To diagnose and fix Death Wobble correctly, you or your mechanic needs to look for "play" everywhere in the steering and front suspension system, searching for anything that could have "play" in it. It's very time consuming to find a Death Wobble fix, and can be downright dangerous while you are in "testing phase", trying to exorcise this demon from your Dodge Ram. Here is a step-by-step guide you can print out and take outside with you, so that you can get your Dodge Wobble problem fixed once and for all. Step 1) The place I tell people to start, is with an overall visual inspection. Spend 10 solid minutes under the front end, visually inspecting each one of the steering components for shiny spots on steel, rubber, or polyeurthane, which is typically indicative of suspension components that are moving around when they are not supposed to be. 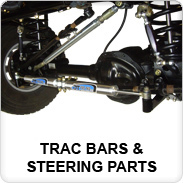 Pay CAREFUL attention to the track bar (also called a Panhard Bar inside and ouside the USA, as well as variant spellings (and misspellings...) of trackbar, tracbar, and trak-bar ). The Track Bar is often the culprit in many cases. And, if any of your bolts are even the least bit loose, Death Wobble also can manifest itself and make your life a living hell, so check for looseness everywhere. Step 2) If everything appears to be "normal" on the underside of your Ram, and you've verified the bolt tightness on both ends of the track bar, the next thing to do is to start with a good quality front end alignment by a reputable shop who is familiar with the nuances of aligning both a stock height and a lifted suspension 4x4. Step 3) Have them make sure that caster (frequently misspelled as " castor ") is set correctly, as well as the proper toe-in. If you have recently hit a large pot hole, curb, or you've been offroading and have bent your tie rod even slightly, that, also, will throw off your alignment. Plus, it's only $40 or so at your local alignment shop. By the way, DO NOT let the alignment shop talk you into a four-wheel alignment, as this is only useful on vehicles with independent rear suspension in my experience, and since there are no adjustment points in the rear of a live-axle vehicle ANYWAY, you're merely paying for a service that you won't get by the time you leave the alignment shop. Furthermore, if you have a lift kit suspension installed on your Ram, make sure that the alignment shop you choose knows the variant specifications for lifted vehicles, and that they do NOT set it to the "default/stock" settings. A good quality alignment shop familiar with lifted Dodge 4x4 trucks will know these settings, and a poor quality shop will likely tell you that it doesn't matter whether it's lifted or not...and that they use the stock specs. If so, walk away immediately, or hang up the phone and call the next shop, if they do. Step 4) If you are now *certain* that the front end alignment that it's set correctly, and that you have not replaced ANY other front end components recently (including tires or wheels) that may have caused the dreaded Dodge Wobble oscillation to begin, I tell people the next most suspect thing is the factory front track bar. Over time, the tie rod end on the upper portion of the Panhard or track bar will develop slop (some applications, including the Dodge Ram, have a rubber bushing configuration, which also wears out) in it due to wear and miles on the vehicle. The same findings often goes for the lower end bushing, which has a rubber or polyurethane isolator bushing in it, and this "slop" will allow the Dreaded Death Wobble oscillation to occur. Aftermarket trackbars generally come with urethane bushings that allow a LOT less "play" (with respect to movement / crush) than the factory rubber bushings do (the Hard-KOR SuperDurometer Track Bar Bushings we developed, due to this problem, has a lot less play than even an aftermarket style Polyurethane bushing). The problem with most aftermarket track bars for the Jeep is that they also come with either a Heim joint, Johnny Joint, or tie rod end on the upper end of the Track Bar, which works fine for a while, but wears out over time, leaving you right back where you started, with a large mess in your shorts, a temporarily deafened right ear (from the wife screaming for dear life, or, quite possibly at YOU, for buying your Ram to begin with, lol), and an overall high level of frustration with your entire Dodge in general...which doesn't often lead into a smooth, stress-free trip. The reason why Dave developed the Dodge Wobble Resistant Track Bar Kit is to eliminate that problematic (and expensive to have to replace when it wears out) previously mentioned joint, as well as for the additional flex benefits you get out of it. If you are running an Dodge Ram with or without Dodge Wobble, and it has more than 1.5" of lift, I highly recommend you check it out. Many aftermarket track bars as well as the stock track bar are completely ineffective in managing Death Wobble due to their "effective angle of operation" particularly if you are above say 2 or 3 inches of lift. Keep the thought in the back of your mind, that another alignment is necessary after replacing ANY front end components, especially if Ram Death Wobble still remains. Sometimes you might get lucky and don't need one...but be forewarned. A complementary product we have found to work VERY well in getting rid of Death Wobble is our exclusive Hard-KOR brand SuperDurometer Track Bar Bushings, which are also available for the Dodge Wobble Resistant Track Bar Kit, and fit most "normal" sized 1.6" ID by 1.25" deep aftermarket and factory track bar end loops, which would originally take a 1.6" OD rubber cartridge bushing. Our SuperDurometer Track Bar Bushings are about TWO TIMES as hard as the typical polyurethane bushings that come in most aftermarket track bars, (which typically are made by Daystar or Energy Suspension for most of the various aftermarket manufacturers). Polyurethane bushings are also one of the least expensive replacement parts in the steering components, so they make sense to try first. Step 5) The next thing to check is your steering damper. I recommend AT THE MINIMUM, replacing the damper (or stabilizer, as it's sometimes called) at the same time as whatever worn components that you find under the front end, as this "combination punch" is very often more effective than the change caused by each of the parts alone. Death Wobble shakes EVERYTHING, and loosens up OTHER components at the same time. I've found that replacing the damper by itself often times doesn't eliminate Dodge Wobble directly, but that it often helps with some other poor handling characteristics, which cause the onset of Dodge Wobble and Ram Death Wobble (such as wandering, for instance) and a new one seems to tighten up the entire steering system. I ONLY recommend the Dodge Wobble Resistant DTP Dual Steering Damper, because it seems to be tighter and work better for stopping Ram Death Wobble than the other manufacturers of steering dampers and stabilizers on the market (and I've tried them all, trying like hell to get rid of a Death Wobble problem years ago). They are also the most heavy duty that I'm aware of. These two stabilizers are the ONLY ones that I recommend to ANYONE who is having trouble with Ram Death Wobble, and it's also one of the least expensive parts to replace in your steering system to attempt to remedy the dreaded Dodge Wobble problem. Another product that we've found assists measurably with Dodge Wobble, is our DTP Steering Stabilizer Steering Box Brace for the Dodge Ram 1500, Dodge 2500, and Dodge 3500, which holds the steering gear box tightly on those two models, allowing the additional stresses of running larger-than-stock tires be directed to BOTH frame rails, rather than depending on the three little bolts that hold the gear to the frame, which get loose and if they do, will snap the gear box ears off the box, and leave you stranded somewhere you don't want to be. Another source of Ram Death Wobble & Dodge Wobble is over-inflated tires ( See Boyle's Law and consider how much more volume of air is inside your 35" or 37" tires compared to stock-sized tires). Step 7) The last thing that I can mention that has caused Death Wobble in the past is hub bearings. If there is a little slop in them over the years and miles, they MAY indeed help to cause the oscillation as well. I mentioned them last because they are the most expensive to replace, and probably least likely to be the ROOT of the problem (though they might be a component adding to the problem). While you have the front end apart, you should consider adding some offset upper ball joints to your Dodge Ram if you're running a lift kit, in order to return the caster back to what a stock Ram would be if you are running say 4" of lift or more. Be aware that on 4x4 models, by NOT changing the ball joints to the offset type, you add more vibration to the front drive shaft since you are also turning your pinion angle downward in conjunction with every caster angle increase. In other words, you can't have one without the other, and on the full-time 4x4 models, you'll get a little vibration at highway speeds by NOT doing so. Compared to Dreaded Dodge Wobble, however, this is a VERY small price to pay, lol. Hopefully this short checklist gets you started on the right foot and helps to cure your Dodge Wobble problems, and gives you a permanent Death Wobble Fix. Thanks Rob. Yeah the dealer checked to make sure I had the tie rod replaced back in 2008 or 2009 maybe. I think is was just a Service Bulletin issue. Previous Owner had already taken it in and replaced they said. Thanks again for your help. As far as we are aware there is not a current recall regarding this issue. Chrysler pretty much has steered away from stating that death wobble is a design flaw in their products, and instead stated it is a maintenance issue. You may want to check with your local dealership to be sure that there is not a current recall for your vehicle. The only thing I saw currently for the steering system is a faulty tie rod end. You can see all recall and service bulletin info by model at safecar.gov. Is there a recall on this? If so, is there a website with the recall information? I have a 2005 Dodge Ram 2500 Diesel Quadcab Laramie 4×4.